Quiksilver Pro 2016 runs at Snapper Rocks, Coolangatta, Queensland from March 10-21. Stu Kennedy and Adam Melling are both in the event looking to turn some heads. Good luck fellas. 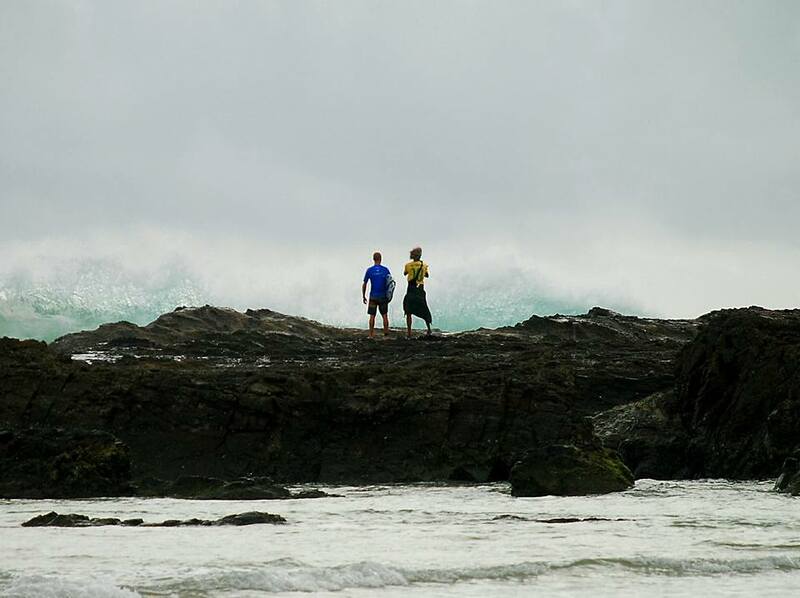 Stu and Mello both surfed well today in tricky conditions but neither could get a win so it's round 2 for the fellas. Stu took on 11x World Champ Slater today in round 2 and took the big fella down. Stu was busy at the start of his heat and put together a decent total to keep Kelly under pressure. A long lull through the middle of the heat made the priority game important and Stu worked it best he could. Towards the end, Slater was chasing a high 6 with priority and found a rare connection all the way down the point. He surfed it very well but looked like his board had too much rocker for the conditions. Right at the finish of Slater's wave the crowd went berserk but it was for Stuey who had found a steeper section and destroyed it. Stu nailed a couple of high speed drifting off the tops and finished with a perfectly executed Club Sandwich. The judges rewarded the way Stu ticked all the boxes in the criteria and gave him a 9.50 ( click here for the wave replay ). Well done mate. Mello was ripping against Kerrzy but couldn't find the right wave to allow a big score to go with his 6.33 and was eliminated. Stu surfed his round 3 heat against another World Champ, Gab Medina today and left the ex No.1 looking inadequate. Yeah that happened. Stu kept his opponent under pressure from the start, nailing committed massive first turns and once again ticking all the boxes in the judging criteria. The world is watching and Stu is showing everyone that he is definitely one of the best in the world. "I knew that if I got through round three it would go to a result that counted, so there was still pressure for sure, because I can qualify through the tour and if I get enough opportunities that’s my goal, so I don’t have to grind it off on the QS as well. That’s my goal – to get back on tour through the CT."
He surfs next in the non elimination round 4 with JJF and Igarashi. Another amazing day in the office at The Super Bank for Stuey today. In the round 4 non elimination heat he should have taken the win but ran over a free surfer in the area and finished 2nd to JJF by less than half a point. In round 5 Stu systematically destroyed seasoned pro SeaBass with an incredible display of power and speed. He led the heat from the start and never slowed down. Stuey once again ticked all the boxes by starting with a massive committed turn and almost hypnotically railling the Snapper walls. He controlled priority and picked the right waves and comboed the Hawaiian. Stu surfs next in the Quarters with Jon Jon and will be looking to square the ledger. Stu Kennedy has finished 3rd at the Quiky Pro Gold Coast. In his Quarter Stu always looked in control and seemed to hold the upper hand against Jon Florence. Towards the end of the heat he was behind but chasing a 7 plus score. The clock ran down with some lulls but Stu found a runner within the last minute and easily took the win. In his Semi Stuey fell a couple of times on average waves but definitely made the most of the decent ones. He put a good total together but the judges gave Andino the nod in the end by 0.03. The last week Stu has shown the world that he belongs on the WCT and Le-Ba could not be prouder of him. Congratulations on an epic result mate.